It gets even more complicated when it comes to the networking side of the story. You're forced to set up two passwords - one for administrators, the other for viewers - which is easy enough, but the network side of things is more tricky. 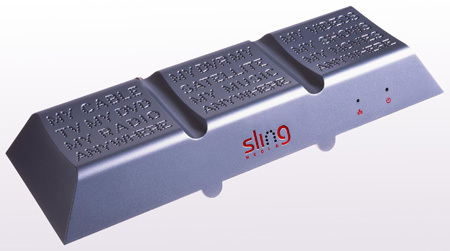 Sling Media does provide for automatic router set-up using Universal Plug and Play. Fine, but most routers that support this feature disable it as default. And then there's the fact that SlingBox, for very good reasons, prefers a static IP address. Again fine, but most routers use dynamic IP address allocation by default to make them easier for folk with little or no networking expertise to use. I ended up setting the networking up manually, giving the box a static IP address my router's DHCP can work with and configuring port forwarding on the router. SlingPlayer isn't the most attractive apps I've used, but it works and at least there's a choice of three skins, and the latest version - for UK users it's 1.3 - has a neat black-look skin missing from the original release. Also added is the ability to listen to the audio stream only, with no pictures, which can be handy if you want to listen to the news while you're strolling round your hotel room and don't need to watch it. The software provides ten spaces for favourite-channel buttons, which is handy for we Freeview watchers who want to be able to ignore the shopping channels and so on. But while SlingPlayer provides suitable channel ident icons for these buttons, and allows you to set up multiple button bars, you can still only show ten favourites at a time. The favourites list in my Humax Freeview-equipped PVR extends to more than two dozen channels, so replicating it in SlingPlayer is effectively impossible. Instead, I have to have three button bars, and to remember which bar contains which channels when I want to watch something else. Worse, setting up a favourite requires you to type in its channel number - the software doesn't default to the one you're currently watching. And you can't move buttons once they're in place, so you need to make sure you get the order right from the start. In the end, I found it quicker to cycle through all the channels, which defeats the object of having favourites. That aside, using SlingPlayer is a joy, because being able to watch UK TV on my notebook anywhere in my house is a joy. Or in the Reg Hardware office. Or in a Taipei hotel room. SlingPlayer connected through to my SlingBox without apparent difficulty, picked up the stream and displayed it. The software cleverly adjusts the picture quality according to the bandwidth. There are limits. Only one person can view the SlingBox's output at any one time, so you may need multiple boxes if you want to feed TV to multiple users simultaneously. In the US, SlingPlayer is also available for Windows Mobile handhelds, but there's no UK-savvy version yet. Both territories have yet to see the anticipated Mac OS X version of the software.